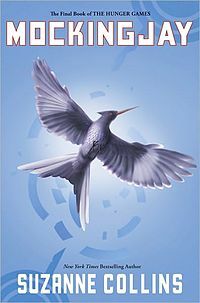 The following is in response to Suzanne Collins‘ “Mockingjay,” the third book in the popular series The Hunger Games. “Real or not real? I am on fire. The balls of flame that erupted from the parachutes shot over the barricades, turning away when one caught me, ran its tongue up the back of my body, and transformed me into something new. A creature as unquenchable as the sun” (p. 348). What have I done so far this break instead of eating turkey or working on this semester’s final portfolios? Reading the last book in The Hunger Games series that’s what! I had been trying to read through a lame PDF version when my good friend Efad Huq bought me an actual copy as a “new thanksmas year” gift, and I sacrificed the first two days of my Thanksgiving break to reading it. Not that I had much of a choice—if you’ve read the book then you know how much of a page turner it is. There was no putting it down. With a new shocking event at the end of every single chapter, I am definitely dubbing this book my favorite of the series. And what a great way to end a series! Though I like endings that are safe and sometimes predicable, I am amazed by the ending that Suzanne gave us. I didn’t breath when I read that primrose died, that Katniss would kill coin—the leader of the rebellion—and end up with Peeta; I was suffocated as if there was a fire in my room devouring all of the oxygen. This entry was posted in Response to book, Response to Fiction, Uncategorized and tagged books, Evin Hughes, literature, Mockingjay, peeta, shocking event, Suzanne Collins, The Hunger Games. Bookmark the permalink.